This great action game will certainly get you very excited, as your mission is very important. The job you are about to do requires great concentration because many of the predators out there are trying to steal your mushrooms. Actually it does not sound like much of a life and death situation, but you really like mushrooms and so do the animals in the forst. Use any weapon you can to defend them and make sure that none of them actually get away with stealing one. Hit the animals with whatever comes to hand and try to set traps and use other items that will give u the edge in this great battle against the starving wild life. Upgrade your powers to become more efficient with your weapons and tools. Use the mouse to navigate through the menu and hit the animals. 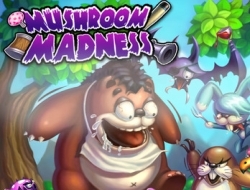 Mushroom Madness 0.00 between 0 and 10 based on 0 votes.